James Ronald Gordon Copeland MBE (born 27 October 1947), known professionally as James Cosmo, is a Scottish actor known for his appearances in films including Highlander, Braveheart, Trainspotting, Troy, The Chronicles of Narnia: The Lion, the Witch and the Wardrobe, Ben-Hur and Wonder Woman, as well as television series such as Game of Thrones and Sons of Anarchy. On 3 January 2017 Cosmo entered the nineteenth series of Celebrity Big Brother, on Day 19 of the series he won a pass to the final on 3 February 2017 and finished in fourth place. 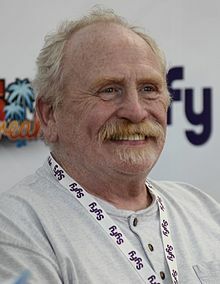 James Cosmo was born in Dumbarton Cottage Hospital, Dunbartonshire, Scotland, UK and attended Hartfield Primary School in Dumbarton. He is the son of actor James Copeland and Helen. Through his father played cricket on Hampstead Heath with Sean Connery while his father was in the pub with Peter O’Toole. He also has a sister named Laura. When he was 11 moved back to Glasgow and later he work for a time at Arnott Young shipbreakers in Dalmuir. At the start of his career adopted Cosmo as stagename surname, which was the middle name of his mother, Helen. Cosmo is best known for his film roles as Angus MacLeod in Highlander, Campbell in Braveheart and as Father Christmas in the adaptation of The Chronicles of Narnia: The Lion, the Witch and the Wardrobe. Over the years he has also had roles in other films such as Trainspotting, The Last Legion and 2081. He appeared in Troy with future Game of Thrones cast members Sean Bean and Julian Glover. He also appeared in UFO as SHADO operative Lieutenant Anderson, in Take the High Road as Alex Geddes from 1982 until 1983 and in 1984 played Jock McLeish in the Minder episode Senior Citizen Caine. He appeared as Lieutenant-Colonel Philip Drysdale in the seventh series of Soldier Soldier. He portrayed Jeor Mormont, Lord Commander of the Night's Watch, in the acclaimed HBO series Game of Thrones. He was involved in the filming of the thriller Breakdown in which he appeared alongside Craig Fairbrass, Bruce Payne, Emmett Scanlan, Olivia Grant and Tamer Hassan. ^ a b c d "James Cosmo on Game of Thrones, Whisky Galore and his strange days on Big Brother". HeraldScotland. Retrieved 31 January 2019. Wikimedia Commons has media related to James Cosmo.